Taking its cues from Hollywood Regency interiors, the Lonnix nightstand is puttin’ on the ritz in a big way. 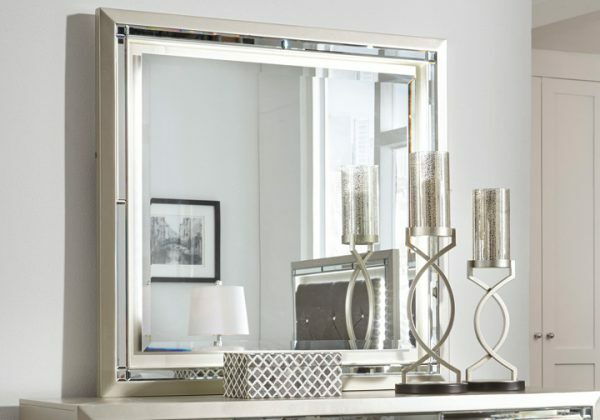 The mirror’s ultra-clean profile is elevated with a spectacular metallic silvertone finish made all the more interesting with a hint of embossed texturing on the sleek frame. *Mirror only. Dresser sold separately. Hollywood Glitz styling with lighting accents. Constructed with engineered wood, solid wood frames and embossed textural drawer fronts and panels. Finished in a warm silver-tone, metallic color. Tufted upholstered headboard cushions feature a cleanable, soft faux leather. Headboard cushion and mirror are back lit with a string of LED lights for added touches of glam. Stylish metal pulls feature inset faux crystals and a bright nickel colored finish. Dovetail drawer boxes with metal center guides. Full (87) and Queen (57) headboards can attach to a bolt-on metal bed frame B100-21 and B100-31 respectively.